The Avenida Apartments punch above it's weight and stands out from comparable apartments offering a range of leisure facilities and caters for dietary requirements in the restaurant - ensuring guests receive the high standard of service they deserve. 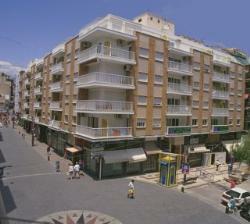 Levante Beach is just 100 yards from the apartments. There is a public transport link within 150 yards. Avenida Apartments comprise of 53 one-bedroom apartments and 18 two-bedroom. All of the apartments have a kitchen, bathroom, air con, phone, TV, fridge, hob, microwave & room safe. "Apartments Are In A Great Position"
We arrived for our two week holiday with our four children at lunchtime. We had booked into a two bedroom apartment. Reception staff were very pleasant and made us feel welcome immediately. The apartment was on the small side and was a little bit cramped. The apartments are in a great position for the beach, which in only a minutes walk away. It is also ideal for the shops, restaurants and bars, you must try the Robin Hood for breakfast, it's great for a "full English". The best Italian is Gigios which is on the Mediterano.